This photograph is believed to be of St Peter’s School Mansfield as it is understood to include one or more of the Newton boys from Crown Farm Mansfield. The children all appear to be well dressed and are of varying ages. Can anyone confirm it is St Peter’s? My auntie taught at a St Peter’s school in Mansfield around 1910 I believe. Miss E Taylor. She said it was a boys school. I do not think it is a picture of St Peter’s Primary School, Mansfield. I was a pupil there from 1958 – 1964. All the walls of the school were stone, not brick. The building is still there as the St Peter’s Centre, next to the Parish Church. The only brick structure at the school were the boys and girls toilets across the smaller rear playground and they had no windows. Unfortunately the photograph is not dated, the Newton children who possibly went to St Peters were Frank born ? Leonard born 1900, George born 1902. John born 1910 went there in February 1918 after first attending school in Forest Town. He could be one of the older boys on the photo, it did come from his home. Do you know the year this photo was taken ? 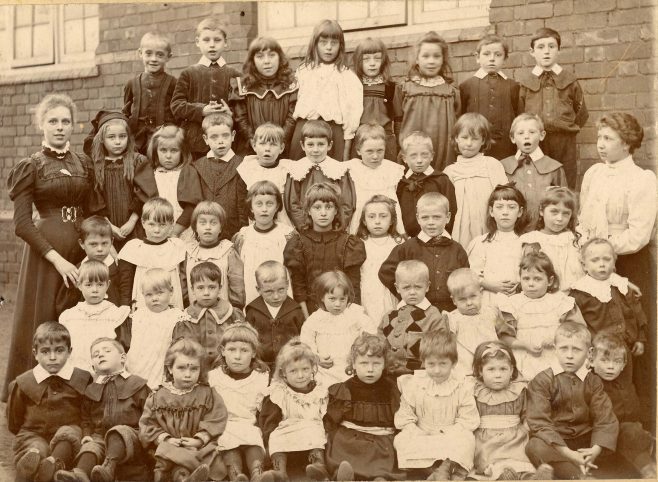 I think it is St Peter’s school, as I believe the small boy on the front row, far left, is my father, John Thomas Ford. He is now 91 years. He attended St Peters primary & junior school, as did I many years later.